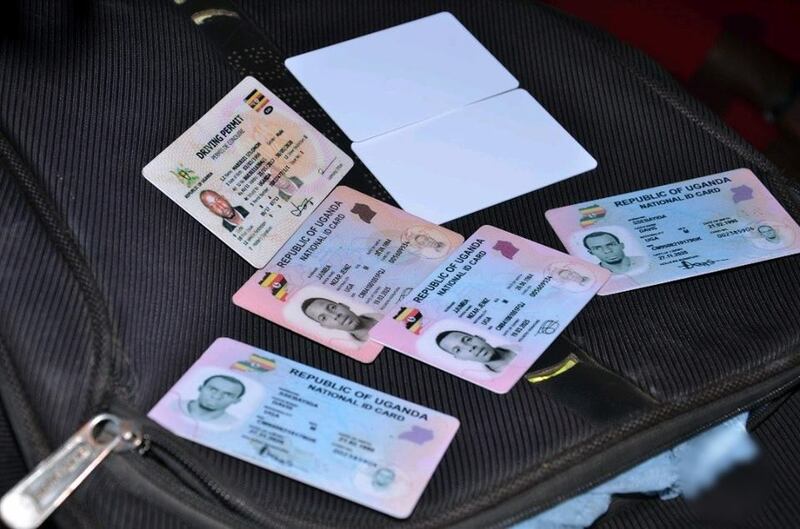 KAMPALA– Police in Kampala have in custody seven suspects for allegedly printing fake national IDs, purported legal documents and driving permits. Mohammed Tarigenda, Dickson Asaba, Nulu Isabirye, Ronald Nkwanga, Joan Nakato, Rashim Nakanwagi and Badru Mutumba were arrested on Thursday from their work at Miracle House located on Nasser Road. Following a tip by some individuals, police tricked suspects who were helping people to live illegally, acquire jobs, default taxes and drive without proper assessment by authorities in Uganda. According to police report, the suspects were caught after an undercover officer who managed to get in touch with a member of the gang, soliciting his help to get an illegal land tittle. The agent was asked to pay 1.2 million Uganda Shillings. On inquiring about the price of a National ID and a permit, he was told it would cost him 120000/- and 130000/- respectively. It’s alleged the suspects were forging, printing these items and selling them to both nationals and foreigners in the country. Police seized the equipment used for forging documents, including a set of tools used in the falsification of official documents and seals belonging to government departments. On checking the forged national IDs recovered from the suspects, the police found out that some bore NIN numbers are already assigned to other citizens while some others were picked as lost and found, subsequently adjusted and carried a non-existent unified number. The suspects have since been taken to Special Investigations Unit (SIU) and are to face charges of forgery vide SD. REF. 45/14/08/2018. Kampala Metropolitan Police Commander CP. Moses Kafeero Kabugo warned members of the public against dealing with such people and to report them to police immediately. “While Nasser Road is committed to raising its image as the commercial printing hub of Kampala, we all have a responsibility to ensure that the law is being followed,” said Kafeero. “Citizens should understand that Uganda has got hi-tech systems used to determine validity of driving permits, national IDs and are recognisable because of their colour, inferior paper quality and absence of security features,” he added. Kafeero condemned forging of official documents as it creates a huge burden on social service provision meant for nationals, frustrates revenue collection in form of work permits and promotes infiltration of wrong elements with criminal minds in the country.